Salco Perfoset Master Kit. 4:1 ratio die punch with inserter jig and pliers. Salco Perfoset Master Kit for plastic coil binding. 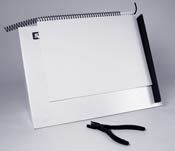 Everything you need to do professional plastic coil binding at an extremely economical price. With the Salco Perfoset Master Kit you get a H-D die punch in the popular 4:1 ratio, a unique, effective, and easy to use manual coil-inserter jig, and a pr. of high-quality plastic coil pliers to finish and trim the plastic coil after it has been inserted in the booklet being bound.